In July of 2015, Dale Earnhardt Jr. led a huge pack of Monster Energy NASCAR Cup Series cars across the finish line on the last lap at Daytona International Speedway. Nearly every car behind him was wrecking, and one tore across the speedway’s catch fence—spewing debris into the stands and onto the track. That car was the No. 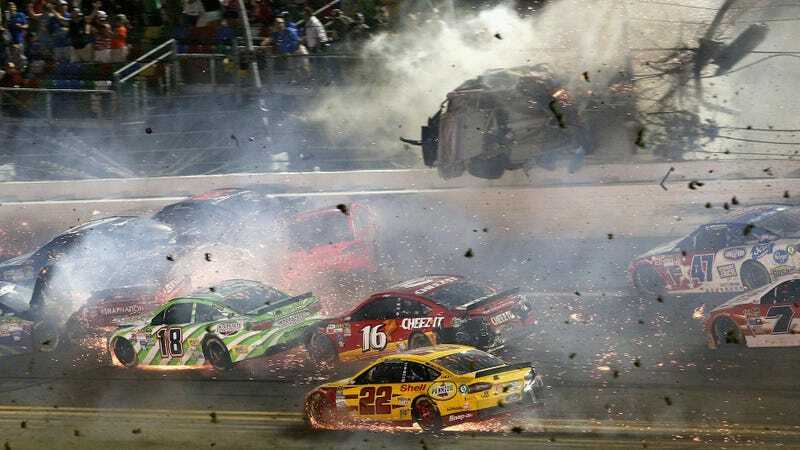 3 of Austin Dillon, and, more than two years later, ESPN reports that people are still suing NASCAR and the track over their claimed injuries from the wreck. ESPN reports that John and Wayne Vanpatten filed a lawsuit last week, but they certainly aren’t the first to do so. That was William Fulton in July of 2016, and ESPN reports that his lawsuit was settled. John and Wayne Vanpatten claim in separate lawsuits that they were sitting in the 12th row of Level 3 and were hit by debris. They also said they were hit by a toxic fluid, which was sprayed onto Wayne’s arm and which John ingested. There was no description in the lawsuit of the specific injuries except that they continue to recover from them. The lawsuits do not indicate their relation. The two lawsuits, filed last week in Volusia County (Fla.) Circuit Court, are the second and third lawsuits filed against NASCAR, the track and track parent company International Speedway Corp. from fans injured in the accident. ... The statute of limitations in Florida for claims is four years. ESPN reports that the Vanpattens’ attorney, NASCAR and the track declined to comment on the lawsuit, but that NASCAR tracks are required to have least $50 million in liability insurance for times like these. Coincidentally, NASCAR’s next race is at Daytona. Earnhardt sure won’t win it, but hopefully the cars out there will come back looking a little bit better than Dillon’s did—and hopefully they’ll stay far away from the folks in the stands.